Talented and easy to understand. Reinvent your way of working without the slightest effort. Easy-to-use interface. You will feel at ease in ThemeChannel because everything is designed to facilitate your learning. The elegant single-window interface provides access to the most common features with a simple click. Create layouts with spectacular graphics, both static and dynamic. 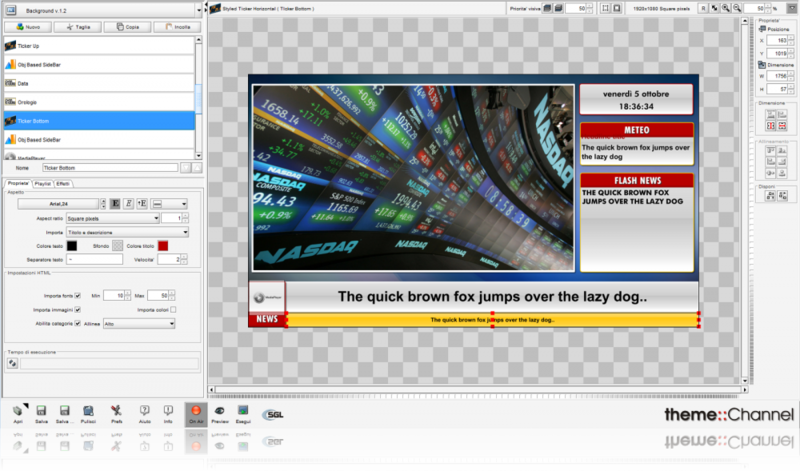 Position, resize, freely overlay your objects using a powerful, easy-to-use Editor. 1,2,3, you are on the air. Easier than that? A pleasure for the eyes and the mind. ClassX develops everything you see, from the first to the last line of code. That´s why everything works immediately in a truly amazing way. Discover the highest quality levels thanks to the powerful and flexible graphics engines developed by ClassX, for years the state of the art of broadcast graphics. Combine endless levels of antialiasing and create completely vector texts using system fonts. The results are visible! 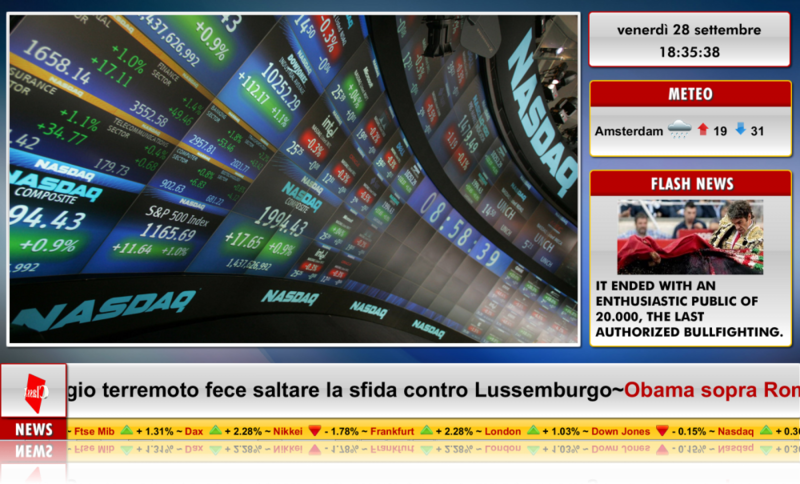 Clear and clean view, based on drag & drop. It will be your ideal companion. Your every wish is an order for ThemeChannelContentManager, let your imagination run wild. As soon as you have it, you will realize you already know how to use it, without problems. The intuitive structure, the clear view, the clean interface and the advanced drag & drop features are just some of the things you´ll admire. Each click becomes easier and more intuitive. 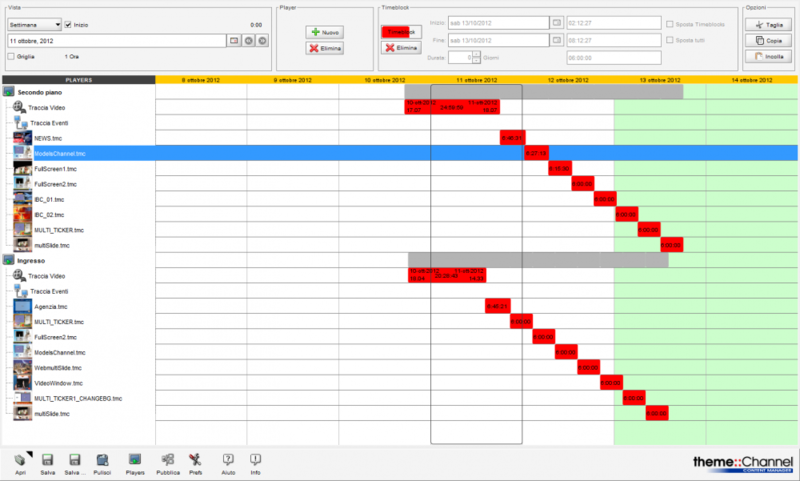 Customize your schedule by associating up to 8 fantastic templates completely overlapping. Find out how simple it is to define a schedule thanks to the time representation that varies from day, week, month and year. All just a click away. Labyrinth? No thanks. All the most important information is in front of your eyes. Find out if a player is not covered by a template and uses drag & drop to customize content and timing. Copy and paste the programming in time with two simple clicks. Play and stop. Easy, even remotely! 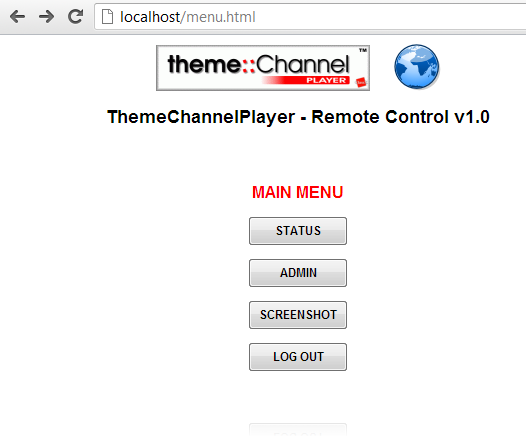 ThemeChannelPlayer is the engine through which you can create ThemeChannel templates. Fully remotely upgradable, allows the playback of contents on any video output device. 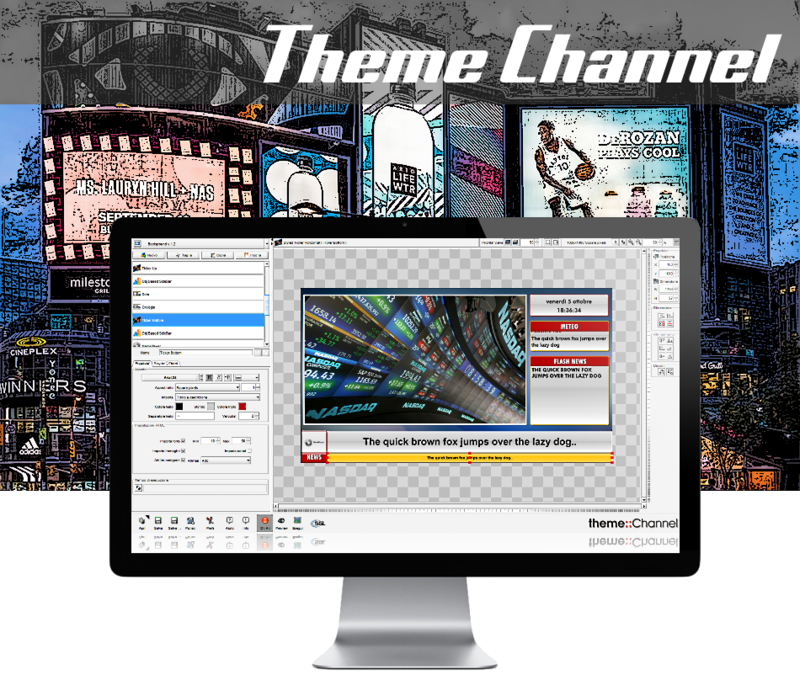 ThemeChannelPlayer has all the necessary tools so that even from a web browser (Firefox, Explorer, ..) it is possible to remotely control the airing of ThemeChannel templates with a preview of what is ON-AIR. Easier than that? A few settings, maximum yield. 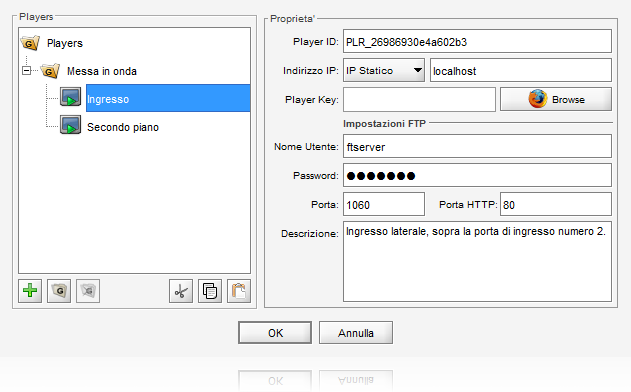 Configuring a new player is a simple and painless operation: enter the IP, the user name, the password. Done. Copy and paste the players or join them into groups for a more functional and engaging view. Describe their location for easier identification. Publish anywhere a show schedule, thanks to ThemeChannelContentManager and start / stop or check the status of the player: you can view a screenshot of the current output via web browser. Easy. In order to use remote control, it is necessary to have an internet connection and a remotely reachable IP address. Thanks to the http server included within ThemeChannelPlayer, you can view the status of the components and control the operation effectively. Schedule already defined? Now it´s time to update the players. From the transmission window of the files that make up the graphic template, it is possible to simultaneously upload multiple files at the same time. The transmission takes place through secure protocols in order to grant the completeness of the files and the privacy of those who use them. Additional security and flexibility are provided by the support for the upload, resume and pause. In fact, it may happen, especially when connections are slow, that there is a need to split the upload of large files into 2 or more steps, even disconnecting the computer from the network. ThemeChannelContentManager will resume uploading exactly where you left it. Furthermore, only the resources that have never been sent will be uploaded. Low overhead, maximum efficiency! ThemeChannelSupervisor verifies the activities of every single Player, through an extremely simple and intuitive graphic interface. It collects the snapshots of individual players automatically updating itself and provides all the necessary tools for the visual control of all the players. ThemeChannelSupervisor uses the same technologies as ThemeChannelContentManager to connect with players. Player profiles are managed by both ThemeChannelContentManager and ThemeChannelSupervisor. Through the preferences it is possible to set the refresh rate of the screenshot. Fill in the below form to request information about this product. An operator will answer you as soon as possible.